This riveting historical epic of love and family, war and loss, risk and destiny is the novel Adriana Trigiani was born to write, one inspired by her own family history and the love of tradition that has propelled her body of bestselling novels to international acclaim. Like Lucia, Lucia, The Shoemaker's Wife defines an era with clarity and splendor, with operatic scope and a vivid cast of characters who will live on in the imaginations of readers for years to come. For years I have been hearing how good Adriana Trigiani is. Some of my favourite bloggers are big fans and there are always lots of really enthusiastic reviews for her books. 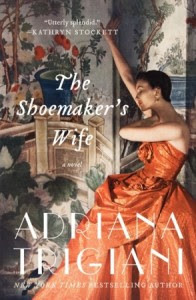 I did read another book by her last year and I liked it, but after reading The Shoemaker's Wife I get it....I really get it! The Shoemaker's Wife was inspired by the author's grandparents story, and you can really see that she is invested in the story that she is telling. Our story starts when we meet Ciro and his brother Eduardo. Their mother is taking them to a convent in small town in the Alps in Northern Italy. Their father has died (they think) in a mining accident in America and she can no longer provide for them and so she takes them to the nuns to be educated and nurtured into adulthood. Whilst both boys miss their parents terribly, they are cared for well by the nuns. Eduardo is more sombre and studious whereas Ciro is a much more physical presence. Ciro is asked to go up to another small town further up the mountain to dig a grave, and at that time he meets Enza. There is an instant connection between the two of them, and who knows, if fate hadn't conspired against them, the story might have begun and ended right there. However, like all star-crossed lovers nothing is as simple as that. As a result of an issue that Ciro has with the local priest he is sent away to start a new life in America and Eduardo joins the church. Ciro is sent to a relative of one of the nuns to learn a trade. He is to become a shoemaker's apprentice. Enza also makes her way to America, travelling with her father to try and earn enough money to send back to her family in Italy so that they can build their house and business up. Enza's father goes on to work in other states, leaving Enza to make her own way in life. After a rough start, Enza makes friends with Laura and the two girls become each other's support and strength and they soon manage to get to New York, find somewhere to live and jobs working in the Metropolitan Opera. They are exposed to the glamour of the opera and to get to know many of the stars including the amazing Enrico Caruso. There are a couple of other meet ups between Ciro and Enza along the way, and each time the connection is clear and strong, but again, fate and also World War I, get in the way of our young couple. Ciro is something of a ladies man, and Enza doesn't sit waiting for Ciro to come to his senses. As a result, the scene where finally all the stars align is both dramatic and poignant. The next part of the book brings a move to another new location when Enza and Ciro move to Minnesota. Ciro builds up his business with the help of his business partner and friend, and also with the active involvement of Enza who uses her skills as a dressmaker and her natural affinity for people to help the family to settle into their new home and to thrive. Structurally, the book is divided into three clear parts and each part has a different feel in a way. What connects the three parts are the strong characters, the strong sense of location whether it be Italy, New York or Minnesota, and the way that Trigiani is able to bring the senses to life with her descriptions of food, of fabrics, of music and of flora. Whilst this book is sad (yes, I cried on the train in public again at the end of this book) there is also an overriding sense of joy. The author manages to evoke the emotions without having the book become maudlin even as the events of World War I come back to haunt the family in ways that could never be expected. If there was a small criticism, I am not sure that we really needed the final chapters. It was nice to see what happened, but the book wouldn't have necessarily been a lesser read without those chapters being there. I gave this book a rating of 4.5/5. 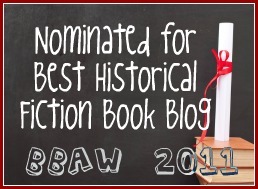 This book counts for the Historical Fiction Reading Challenge and for the War Through the Generations challenge. I thought for a bit of fun I might see if I could find a video of Enrico Caruso who plays such an important part in the life of Enza in particular. I lucked out when I found a clip of both his voice, and also images of New York at around the time that Enza would have been living there! I actually wasn't sure that I would know the song that was used in the clip, until it started and I realised that it was a song that is used in a TV ad for a pasta sauce brand here. See, I am more cultured than I realised! I can't wait to read this one! My gr-grandparents came over from Itally about this time. Love the video clip. Thanks for sharing. So glad you enjoyed the video. I thought it was lots of fun! This was my first Trigiani book...and I loved it too! It won't be my last! No, I think I will be waiting for each new release with a great sense of anticipation now! I'm going to have to read this one. It sounds great! It's a lot of fun Susan. I hope you enjoy it! I have this book out from the library right now. I am not sure I will get to it, though, and I imagine someone else wants it... We will see how it goes!